In Europe, They Call For Death To Jews. Again. Few European Jews speak or understand much Arabic. But there is one phrase many have recently come to know: "Khaybar Khaybar ya-Yahud, jaish Mohammad saya'ud." The words refer to the battle of Khaybar, in which the Prophet Mohammed slaughtered and enslaved hundreds of Jews, including women and children; "Mohammed," it means, "is coming back for you." It is a death threat to Jews everywhere, and it is being shouted out with growing frequency these days on the streets of Paris, London, Amsterdam, and Berlin. What's worse, increasingly the threat is not merely idle: in one of the worst episodes of anti-Semitic violence to hit Europe since the Holocaust, Jews are being attacked in their synagogues, their shops, and even in their homes. And most experts believe things are going to get worse. Since the beginning of the latest clash between Israel and Hamas on July 8, European Muslim groups (and some European leftists) have engaged in violent protests aimed not only in supporting Palestine (or, as in the case of a demonstration in The Hague, supporting ISIS), but in calling for the destruction of the Jews. "Slash their throats," Muslims chanted in a July 26 pro-Palestine event in Paris. "Death to the Jews." In The Hague, a group of mostly Dutch-born youths of Moroccan background repeated the now-familiar refrain: "Hamas, Hamas, all Jews to the Gas," along with new ones: "Itbah ya Yahud" ("slaughter the Jews") and "Khaybar Khaybar ya-Yahud." The outcome: over 130 incidents of anti-Semitism, some violent, reported in the UK during the month of July alone – the second highest number on record; in the Netherlands, where increasing numbers of Jews are leaving, the normal average of three reports of anti-Semitism per week has skyrocketed to more than 70; and the number of French Jews moving to Israel is approaching a record high. Jews are being attacked in the streets, synagogues burned, Jewish homes firebombed. But what European officials conveniently overlook is that this hatred didn't happen overnight. It didn't simply emerge when the first shot was fired against the rockets being slammed against Israel from the Gaza Strip, or when Jewish extremists, in retaliation for the kidnapping and murder of three Israeli boys, kidnapped and killed a young Palestinian. The recent events in Israel-Gaza have formed only an excuse, an opportunity to release the venom that has been coursing through their veins for years, perhaps their entire lives. And Europe – its teachers, its governments, its neighborhood associations, its libraries – has done absolutely nothing at all to change that reality. To the contrary, many Dutch and British schools have surrendered to demands by Muslim students that teachers leave out lessons on the Holocaust, "or else." (According to Esther Voet, executive director of the Center for Information and Documentation Israel [CIDI], a Dutch-based Jewish civil rights group, one in five teachers in the Netherlands have stopped teaching about the Shoah. Those who do teach, she says, often have their own anti-Jewish biases.) That the students are not arrested for their threats on the lives of teachers offers them another lesson: Attacking Jews is easy, they discover; no one is really bothering to defend them. This is why no security guards protected the Brussels Jewish Museum when Frenchman Mehdi Nemmouche, freshly returned from the Syrian battlefields, arrived at its door on May 24, pulled out a machine gun, and killed three people on the spot. (A fourth victim died of his wounds a short time later). It is why police in The Hague did nothing to stop the pro-ISIS demonstrators on July 26, and why the city's mayor insisted that "no boundaries were overstepped" by those who called out for "death to Jews." It is why the Dutch government does not secure Jewish organizations, buildings, or events; the costs for such safety measures are covered by the Jews themselves. It is why, in 2013, a Turkish-Dutch teen told an interviewer on national TV that he was "pleased" with what Hitler had done; that women and children were also killed, he said, did not concern him – they were Jews. As he spoke, his friends, seated beside him, nodded their heads in agreement. It is why, although Russian separatists in the Ukraine likely blew up a Malaysian Airlines/KLM flight, killing nearly 300 Dutch and 24 Australians, there have been no reports of attacks on Russians living in Australia or the Netherlands. No one has firebombed their homes. No one has expressed prayers for them to die. And it is why, now, Europe is seeing the rise of a level of anti-Semitism many say is the worst since World War II. · In France, eight synagogues were attacked within a week. · In addition, reports the Sunday Times Leader, on July 20th "a mob of 400 armed with petrol bombs rampaged into the mainly Jewish Paris suburb of Sarcelles and attacked a synagogue, a pharmacy, and a kosher supermarket. Their banners, reading 'Death to Jews" and 'Slit Jews' throats,' were chilling." The supermarket burned to the ground. 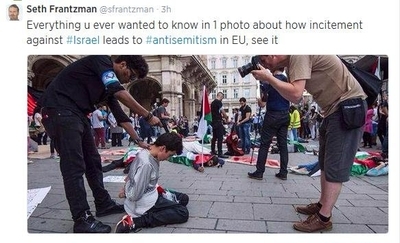 · In Hamburg, on June 19, protesters attacked an 83-year-old Jewish man during a pro-Israel event held in solidarity with the three boys who had been kidnapped and killed by Palestinians. When his daughter rushed to his aid, they beat her, as well. · In Wuppertal, Germany, an 18-year-old Palestinian was arrested on July 31st for hurling three Molotov cocktails into the Bergische synagogue. Noted the London Times, "the symbolism of the target has not been lost on the Jewish community, which rebuilt the synagogue after it was burnt to the ground on Kristallnacht, the Nazi pogrom against Jews in November, 1938." · A week earlier, reports the Washington Post, "Israel Daos, a shy, 18-year-old Orthodox Jew, was punched in the face on his way to a synagogue in central Berlin. Daos described his assailant as 'Arab or Turkish.' 'I heard what the protesters had been saying, because they march not far from here, and I have heard them shout, "Death to Jews!"' said Daos. 'But I did not think things would get this bad." · In the Netherlands, demonstrators at a pro-ISIS rally in The Hague repeated a rhyming chant that called for "Jews from the sewers" to be killed and sounded out the "Khaybar" refrain. Police did not intervene. · On July 30, Seraphina Verhofstadt, a Jewish woman living in Amsterdam, was severely beaten after hanging an Israeli flag on her balcony. Her attackers, she alleged, "stomped on my stomach, hit my ribs and my head." The incident occurred around the same time that vandals firebombed the home of Mexican-born Leah Rabinovitch, crying "Jews must die. Hitler will return." Other Dutch use words instead of violence. "There has never been so much anti-Semitism on the Internet," AT5 television news reported in late July. Indeed, the Dutch Center for Reports on Discrimination noted last month that it sees more anti-Semitism on the Internet than any time in its 17-year history. And in the UK, where anti-Semitic incidents rose by a third in the first six months of this year – increasing since the start of current operations in Gaza – the Jewish Chronicle warned that "2014 is likely to be one of the worst years of antisemitism ever recorded in this country." Things are no better in Belgium, despite professed concerns about the murders at the Jewish Museum. In Antwerp, for instance, a Jewish woman visiting a local shop was told that, "We don't sell to Jews." In the shop window, a sign in French and Turkish stated, "Dogs welcome. Jews not." Two weeks later, also in Antwerp, a physician refused to treat a Jewish woman with a fractured rib, telling her son, "Send her to Gaza for a few hours, then she'll get rid of the pain." And in a debate about the Israel-Gaza conflict on France 24, German journalist Ulrike Koltermann suggested that the Jews had invited the July 13 attack on the Paris synagogue because the congregants "were praying for Israel." What's more, she said, members of the Jewish Defense League fought back. Her debate counterpart, Causeur editor Gil Mihaely, who is Jewish, snapped in sarcastic reply, "Jews fought back?! Outrageous!" And in the same debate, Newsweek Middle East bureau chief Janine Di Giovanni accused Israel of lying, calling reports of Palestinians using human shields and planting missiles in civilian areas – an internationally recognized fact -- "myths" perpetuated by Israel. Yet even with a full new edition focused on European anti-Semitism, the magazine's editors have said nothing of Di Giovanni's comments. Now, at long last, it seems that some of Europe's leaders are starting to step forward. Germany's Angela Merkel has been the most outspoken, announcing, "The security authorities are taking every attack onto a Jewish institution very seriously. Anti-Semitic acts are being prosecuted consequently and by all legal means.'" In France, Claude Bartolone, who leads the ruling Socialist Party in the National Assembly, stated, "Nobody insults a human being because he is a Jew without being subject to abject condemnation; nobody participates in or supports an attack on a Jewish business without being part of a movement that threatens, above all, to lead civilization into barbarity." But hatred can't be legislated away. And it is not easily unlearned – particularly when much of an entire generation has been deprived of the education that would help them combat those influencing them to hate Jews in the first place. It can only be prevented; and in this, Europe has failed. And so once again, Europe's Jews are fleeing. And therein lies the irony: because as one friend said, "This is why we needed Israel. This is why Israel must be." I have been saying the same for ages now and I also been saying that it's time for the true Muslims to stand up and be counted!!! The writing has been on the wall fo a long time. I certainly with others have been bringing all sorts of anti-Semitism to the fore on the net BUT you all decided to ignore it or sweep it under the carpet - do not rock the boat phenomenon. It will not go away unles you stand up to it . Antisemites are cowards - fight them if you wish to stay in your country of birth. Form vigilante groups - tell the police what you will do. Alternative - become a Jew and enjoy Israel! Anti-semitism: A Wake-Up Call for Europe AGAIN! For this kind of conduct to continue throughout Europe is only possible when those in authority do nothing. Belgium, France, The Netherlands and Germany need to take a stand against these outrages and crack down on those doing these terrible against other humans. It's time for the good and honest people to rise up against this tyranny. And why is the response on the part of the Europeans so weak to protect their Jewish citizens? Because they don't want to offend the Muslims who are responsible for stirring up this hate. In other words, Europeans, as I have said over and over, are tolerating intolerance in the very name of tolerance. What is needed is not the wringing of hands and mere words. What is needed are arrests and stiff jail terms followed by the stripping of citizenship and deportations. The Europeans need to wake up to the fact that once the Jews are gone, they will be coming for all those (nominal) Christians.